This past week, I testified in support of S.B. 321, An Act Stabilizing Working Families By Limiting “On-Call” Shift Scheduling, a bill now under consideration by the Committee on Children. S.B. 321 is similar to the bill that I had proposed in the past to reform the unfair and abusive labor practice that requires employees to keep their schedules open for a potential shift with no guarantee that they will be called into work. Employees receive no financial compensation for keeping their time open, and are subject to being called into work on very short notice, frequently within the hour. I was recently joined by Lexii Evans, an hourly retail worker and student at Capitol Community College, when testifying in support of S.B. 321, a bill to reform the unfair practice of “on-call” shift scheduling. “On-call” shift employment policies mainly impact workers in chain restaurants and at large retailers, which employ many part-time, hourly workers in low-wage jobs. Many of these workers are single parents who experience extreme stress when they are called into work on short notice and are forced to make last-minute child care arrangements. Some large retailers have recently stopped this practice by giving their employees future notice of their schedules, but many others have not. We need to pass S.B. 321 to make our state a more stable and predictable place to work for all of its citizens. 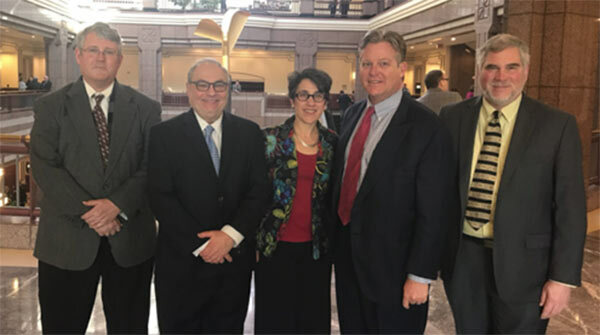 I was joined by the leaders of NAMI Connecticut in support of my proposed reforms to provide better coverage for mental health and addiction services. 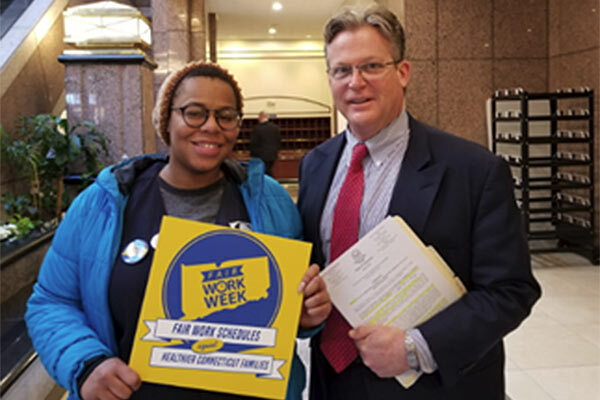 Many Connecticut residents assume that we now have parity for coverage and payment for mental health services, but we do not. 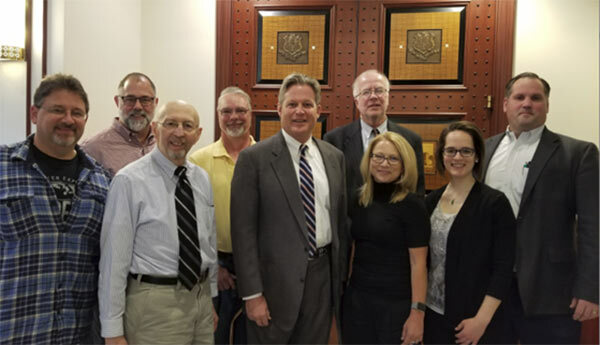 In the photo from left to right: Thomas Burr, Community & Affiliate Relations Manager, NAMI Connecticut, Mark Krantz, Board Vice President, NAMI Fairfield, Loretta Jay, Board Co-President, NAMI Fairfield, Senator Ted Kennedy, Jr., and Rob Fry, Board Co-President, NAMI Fairfield. As a health care lawyer and advocate for people with disabilities, I understand the continuing troubles that Connecticut health insurance policyholders still have in accessing mental health treatment. That is why I introduced two bills, S.B. 383 and S.B. 384, that will make mental health and substance abuse treatment just as easy to get as any other health condition. S.B. 383 will shift the onus of securing needed care from the patient to the insurer and require health plans to find a doctor or other provider that will treat their policyholder in a reasonable period of time. Right now, when patients are denied care, they are on their own. They are forced to call through a list of network providers in the hope that they can find alternative care. S.B. 384 will require health plans to expand their networks of mental health providers. Simply said, health plans in Connecticut have not contracted with enough mental health providers to meet the need of their policyholders. A recent study by Milliman, an independent consulting and actuarial firm, revealed that 34 percent of mental health office visits were out-of-network in Connecticut, compared with only 3 percent for medical/surgical utilization, a nearly 11-fold difference, and one of the largest discrepancies of any state in the nation. The high proportion of out-of-network behavioral care means that mental health and substance abuse patients are far more likely to face high out-of-pocket costs. Cost is one of the most common reasons people give for not getting needed mental health care. S.B. 383 and S.B. 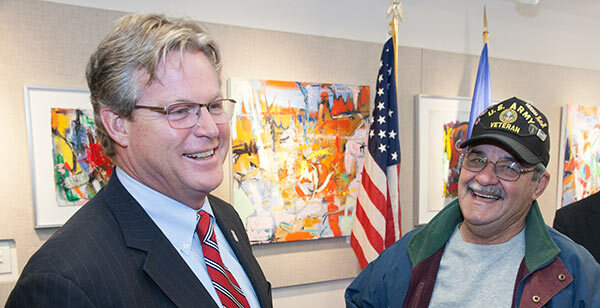 384 will help ensure that all Connecticut residents have timely access to mental health care. Connecticut is the only state in New England that has not passed fair prosthetic insurance coverage legislation. This means that our state’s 20,000 amputees may not have adequate coverage reimbursement for their needed artificial limbs. Brenda Novak, Co-Founder, Connecticut Amputee Network and Branford resident alongside her colleague, Herb Kolodny, and many other advocates joined me to testify in support of S.B. 376, a bill to ensure adequate payment for artificial limbs. At issue is a growing trend by private health plans to reduce or eliminate prosthetic coverage. While many insurance companies do pay for artificial limbs without extensive requirements, others have imposed restrictions on the number of devices that a health plan will cover or offer unreasonably low limits to how much they will pay for a device, making the new limb prohibitively expensive for ordinary policyholders. Some health plans will approve an amputation, but not a prosthetic limb. Others reject medical claims for prosthetic devices because they figure that Medicaid or another state program will pick up the tab. Over 20 state legislatures across the nation have passed laws just like S.B. 376, which simply requires that fully-insured plans in Connecticut adopt prosthetic coverage and reimbursement policies at least equal to the coverage that Medicare currently provides for such devices. Medicare’s coverage and payment policy is reasonable, affordable, fraud-sensitive, and periodically peer-reviewed. This policy is easy for health plans to understand and implement because they already have networks of providers and already process these claims for their Medicare plan participants. To its credit, the Insurance and Real Estate Committee of the Connecticut General Assembly raised bills concerning this issue in 2009 and 2011 that were voted favorably out of the Committee with broad, bipartisan support, only to fail to be passed by both chambers. There were no subsequent legislative attempts to pass the measure largely because of the hope and expectation that the federal Affordable Care Act would address the issue. Now that times have changed and the Affordable Care Act faces uncertainty, prosthetic parity advocates are reigniting their state legislative approach. A strong economic case can be made in favor of this legislation. A recent RAND analysis verified that the incremental coverage costs of similar legislation (estimated by the Connecticut Insurance Commissioner to be $0.35 per member per month in 2009) was far outweighed by factors such as economic productivity of those returning to work, enhancing quality of life, living independently, preventing falls, and avoiding dependence on government assistance. As an amputee, I view this proposal not in financial terms, but as an issue of fairness and justice.